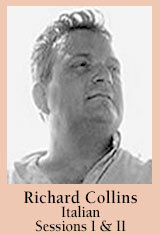 Mr. Collins is a certified language pedagogical director by Inlingua International of Bern, Switzerland. He holds a Bachelors degree from the University of Utah, a Masters of Arts Literature from New York Universidy and is a candadate for PhD in Languages and literature at the University of California, Los Angeles. Mr. Collins is a lecturer at the Centro Linguistico Ateneo at the University of Verona and Director of the Inlingua School of Languages and Translation Center in Verona. Additionally, he is the foreign coordinator for the University of Southern California Cultural and Language Studies and Coordinator and Language Instructor for the Study Abroad Program at the University of Southern California, in Verona, Italy.